Even the Darkest Night Will End and the Sun Will Rise: Les Misérables. Okay, friends. The Kony 2012 conversation is, by no stretch of the sub-cranium, ceasing. * While the internet-fad-ness of it may dissipate, i am making this public pledge to you here and now to do my best to keep you informed of updates i think pertinent. I love Uganda with all of my being, and i sincerely hope our discourse is not an end. But, in lieu of the enormous amounts of literature i’ve been consuming and small amounts of it i’ve been outputting, i did not post something that i intended to last Thursday afternoon. 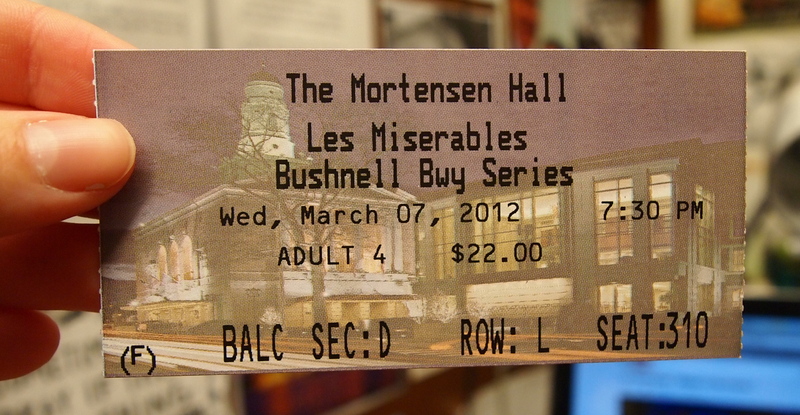 For it was last Wednesday night that i treated myself to a night at the theatre; as mentioned last week, a touring Broadway company production of my absolute-until-death-do-we-part-favorite musical of all-time-until-oblivion, Les Misérables, was in town. And while initially i was invited to go with some friends, work schedules got all mixed-up and no one was able to go with me. Undeterred and unwilling to miss a chance to see a show i hadn’t experience live since i was nine years old, i booked a ticket. By myself. In Connecticut. Understandably, last week i didn’t want to interrupt the flow of our conversation on Kony with chatter about musicals and mastra-dates,** but … it’s midterms. I’m exhausted and i just want to talk about escapism and theatre and frivolity right now. Going to the theatre alone was certainly full of firsts but, thankfully, one without hiccups. Parking free and well-lit, they hadn’t misplaced my tickets, and there were no extraordinarily tall folk occupying the seat directly in front of me. I arrived almost an hour before the show started, being somewhat of a compulsive on-time-type-a-lady, so i spent the better part of it wandering around the Bushnell Theatre in downtown Hartford. And lemme tell ya, the place is swank. I’ve seen some lovely theatres in my day, but this one was a diva among the stars in your multitude. 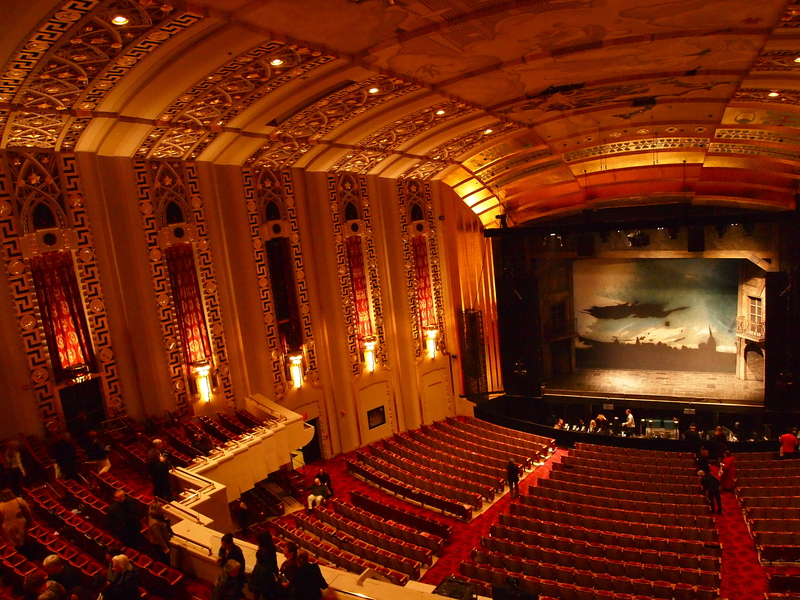 When i took my seat, found in the second-to-last-row of the balcony, i found myself in awe of the building itself. I always love it when theatres have character; the homes i made in the blackbox and stadium-seating style performance areas in high school epitomized “character.” They were endearing and quirky and drenched in histories of dark one-acts so obscure Edward Albee himself would be impressed – or aligned with the memories of so many to-be-giants having sung their hearts out on that very stage long before. This theatre, though, was a character of her own. The elaborate décor along the walls and ceiling made my neck hurt from gazing. It was like sitting inside an enormous, intricately painted jewelry box. I felt small and insignificant – that is, until the curtain rose and i was one with the gods (and heaven is near (am i pushing this references too far? (impossible!))). as close-up as i could get from the edge of the balcony! 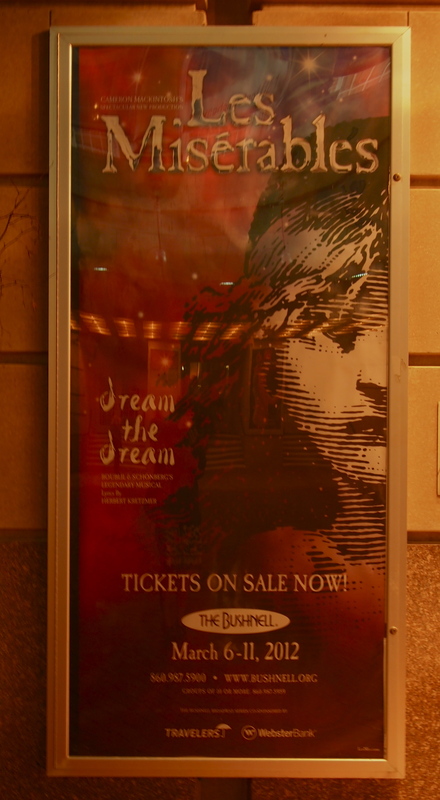 Les Misérables is, at its core, a show about resilient faith in the face of a bleak and unforgiving world – and while the stories of such unyielding belief in goodness and the light move me to unladylike levels of sobbing-my-eyeballs-out-dom, that bleak and unforgiving world paints the story in such artistically realistic hues. And the re-staging of the performance is pure theatrical brilliance, conveying with the dressings of the show such contrast. The vivacity of the score by Boubil and Schoenberg have never ever been so beautifully matched by the set, costumes, and aesthetic of the piece. Through incorporating elements of Victor Hugo’s original paintings into projection-driven set backgrounds and blocking, the story takes on a new dimension in its visual impact. 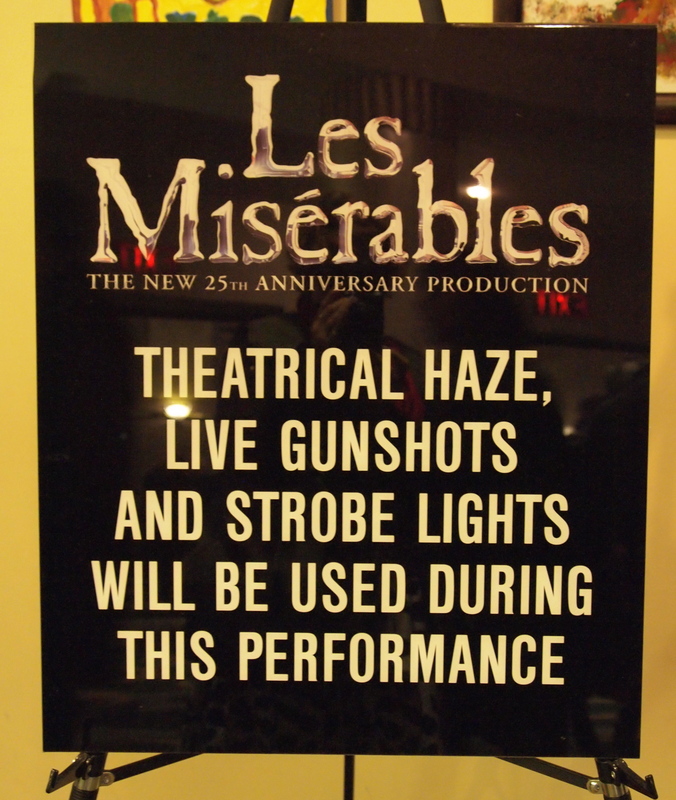 The profundity of Gavroche’s bravery – and tragedy – are deepened in the newly-conceptualized barricades scene. And this hardly even touches on the extraordinary talents of the cast; Enjorlas’ voice was so divine i scarcely believed him to be human (though his curly blonde locks’ real-ness convinced me well enough to not suspect alien vocal invasion). Eponine and Fantine were pitch-perfect in their character choices, singing abilities, and gut-wrenching acting. Grantaire made me hate the students’ folly – and Marius made me understand why Enjorlas was a man worth dying beside. But most of all, there was Jean Valjean. 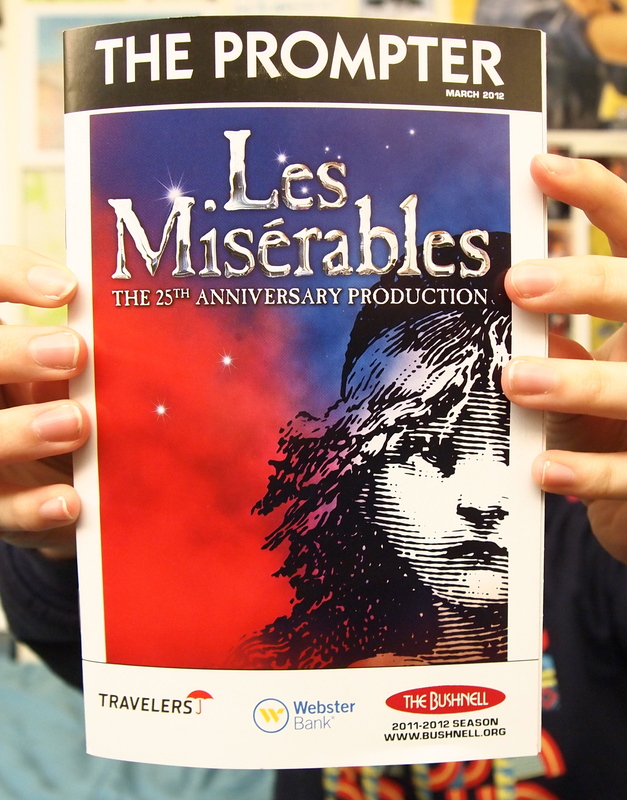 Throughout the whole of my life – even longer than Harry Potter – this musical has been with me. And in my life there are so many questions that somehow seem wrong i have empathized with different characters most deeply in different time. In some ways, it has always been Javert; the tragic, misguided and broken villains always woo me in ways that make me question my neurotic tendencies when cast in alternate lights. When i first flattered myself to think i was in love, it was Éponine; when i was seven and didn’t quite grasp the concept of the show, i loved the Thénadiers more than anything. And as i grow and change and come to know each character differently, i don’t relinquish any love i had for the others – but it does change. And this show, there was not one, but two people with whom i felt like the earth moved in a way that made our consciousnesses parallel; Jean Valjean, portrayed perfectly by J. Mark McVey, and Enjorlas, played by Jeremy Hays. With Enjorlas, it makes perfect chronological sense: he is a passionate, somewhat zealous, convinced student who sees only the quest. I won’t be so bold and self-congratualting to say we have much in common, but the student-martyr complex is certainly something I empathize with (on a perhaps more muted level). This Friday, as it so happens, is Rachel Corrie day, and if you’ve been with me since the start of my blogging endeavors, you might recall that she is one of my beloved – if not more complicated – heroes. But Valjean. Valjean was just love. Which, at the end of the day you’re another day older, is what the show is all about. Love, transcending all adversity, all misery, all pain. So as for the mastra-date? Yeah, totally worth it. While i may have unnerved my theatre-attending neighbors with my blubbering and program-clutching, it was a surprisingly transcendent and beautiful experience to go. And i would not have missed this show for anything in the world, weird looks for solitude included. best thing in my life right now: spring break is so freaking close it is tantalizing. *In fact, i just made a video blog furthering the conversation if you care to have a look. **mastra-date: noun; to take oneself out on activities usually appropriated for couples to engage in, such as going to the movies, eating fancy dinner, or sitting alone in the tippy-top of the balcony bewailing Gavroche and clutching onto a bag of tissues like your life depends on it. Austinian root, of the roommate genus. The Children are Not Invisible: PART II. Rachel Corrie: A Day of Remembrance. I’m so happy for you that you got to see this! What I think is really cool about going on a mastra-date is that the experience can be really and truly yours. I remember when I went to see Deathly Hallows Part Two by myself the weekend before it was due to leave theaters. Oh, looks I got, especially from the guy at the ticket counter! EXACTLY! I saw Deathly Hallows Part II mostly alone as well – i was in Kampala at the time, but i asked my friends if i could sit alone in the theatre and they complied. It was all mine, in a very bizarre and yet totally normal way. 🙂 Thanks for the kind words, as always! Love the post! 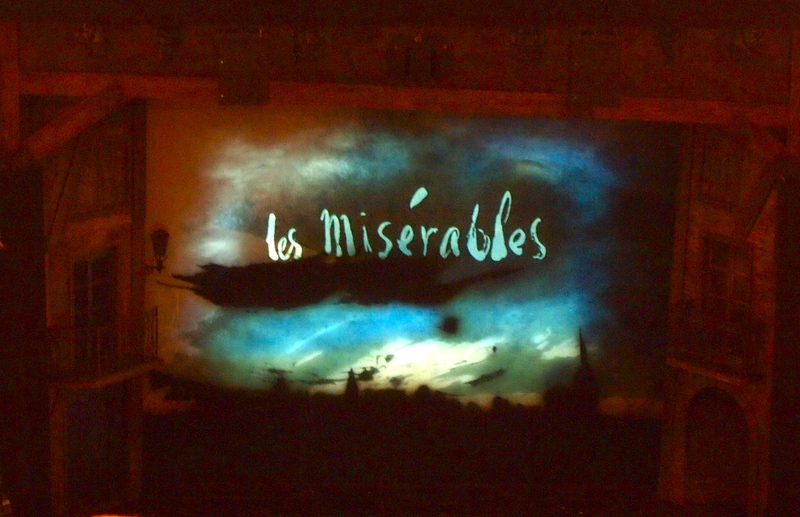 Les Mis has always been one of my favorites too. I’ve seen it several times, but never written about my experience in such a beautiful way! Thanks for sharing your “mastra-date” with us. 🙂 I’m enjoying following your blog and look forward to many more lovely tales of adventure. Seriously! And yet i kind of loved it 😀 Let’s wander around London and see plays together sometime, yes? 1. You can never push references too far. 2. That show sounds like the PERFECT place for a murder. Gunshots and strobe lights? That would have been the perfect cover for John Wilkes Booth and he could have gotten away in the confusion. 2. Seriously, though! Save for the fact that the seat were a bit humbly-jumbly and on top of one another. Hard to strangle someone when the person adjacent is far more than rubbing elbows (hobnobbing here, amongst the elite…)! It is actually spelled En-jol-ras.